Other: Delineation and identification of trees and shrubby vegetation. 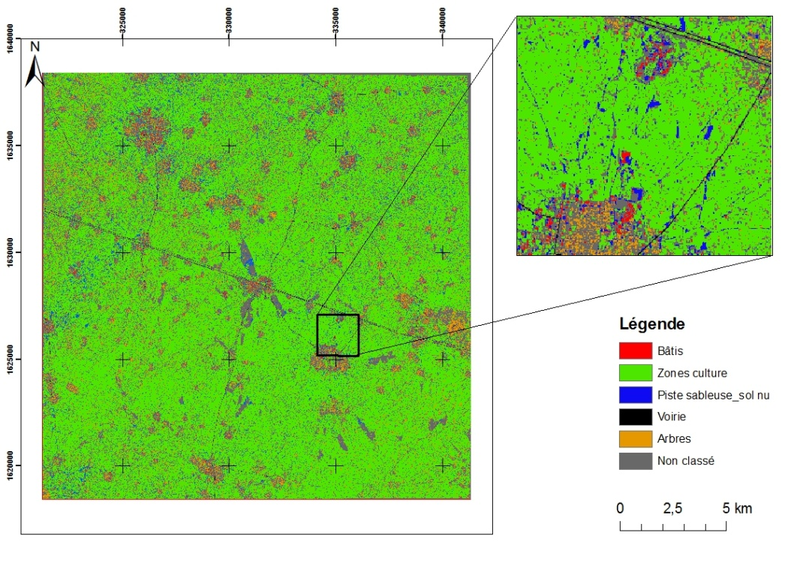 Vegetation field data collected in Bambey study area and used for satellite image processing was as follows. Table 1 Vegetation Field Data Collected in Bambey Study AreaFor each culture and trees, we collected geographic information with the GPS, the types, the species and the states of the culture or tree (Figure 1). Weekly rainfall data from 2013 to 2015 was collected by the ISRA/CNRA Bambey Institute. Figure 1 Pléiades Image Showing Different Tree Species in Bambey Study Area Plans for Next Growing SeasonTo build on these first results in the near future, and especially to improve identification of trees, we plan to use satellite images with a richness of bands and a high revisit time, such as the Sentinel-2 sensors which have 13 spectral bands during the dry season when trees are leafy.